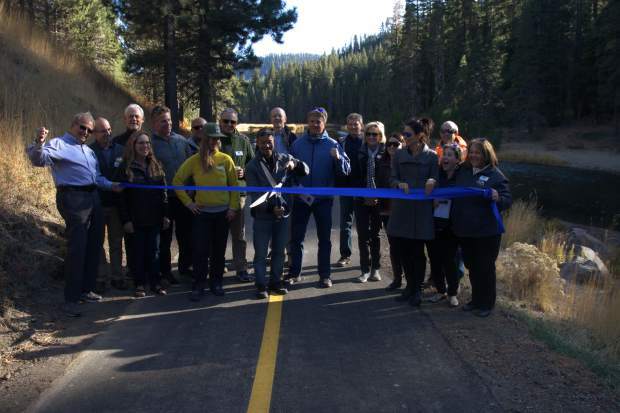 The Tahoe City Public Utility District and Placer County officials celebrated the reopening of the Truckee River Trail after a summer long reconstruction project. TRUCKEE — The Tahoe City Public Utility District and Placer County officials celebrated the reopening of Truckee River Trail after a summer-long reconstruction project. The Truckee River Trail has been in use since 1981 and is the most-utilized trail in North Lake Tahoe region with over 250,000 users accessing the trail each year according to the Tahoe City PUD. Gufstason said that when the trail was originally constructed it was not built in the best place to withstand cracking and water runoff. The project aimed at repairing damage from erosion between 64-Acres Park and the entrance to Squaw Valley, adding another 20 to 25 years of expected lifespan to the trail. Over the last few years the Placer County Board of Supervisors has approved portions of the funds needed, totaling $1.6 million in Transient Occupancy Taxes while the Tahoe City PUD contributed $383,000. Last week, an additional 2.2-mile of paved trail opened extending from the existing trail in Tahoe City from Dollar Drive along State Route 28 to Fulton Crescent Drive. The new edition of the 10-foot wide trail expanded the lakeside trail system to connect the neighborhoods of Cedar Flats and Highlands into Tahoe City and further to the West Shore and Squaw Valley. This portion of the trail was the first addition the county had made to the trail since 2012. Before the addition a trail existed from Dollar Point through Tahoe City, south 10 miles to Sugar Pine Point State Park and from Tahoe City to Squaw Valley Resort. The trail picks back up in Truckee at the Legacy Bike Trail and stops near the Truckee Airport. Hannah Jones is a reporter for the Sierra Sun, a sister publication of The Union. She can be reached at hjones@sierrasun.com or 530-550-2652.